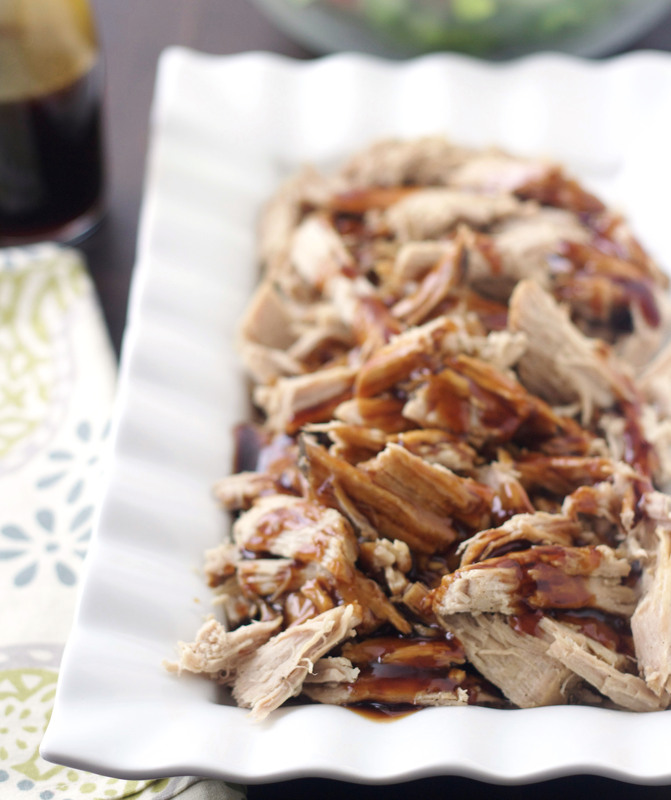 Tender and incredibly delicious, this Sweet Balsamic Glazed Pork is so simple and fast to make. The glaze is truly amazing! I feel like I struck gold when I found these recipe awhile back. Honestly, this pork is just crazy delicious! My boys go crazy when I make this and they are all but licking their plates. 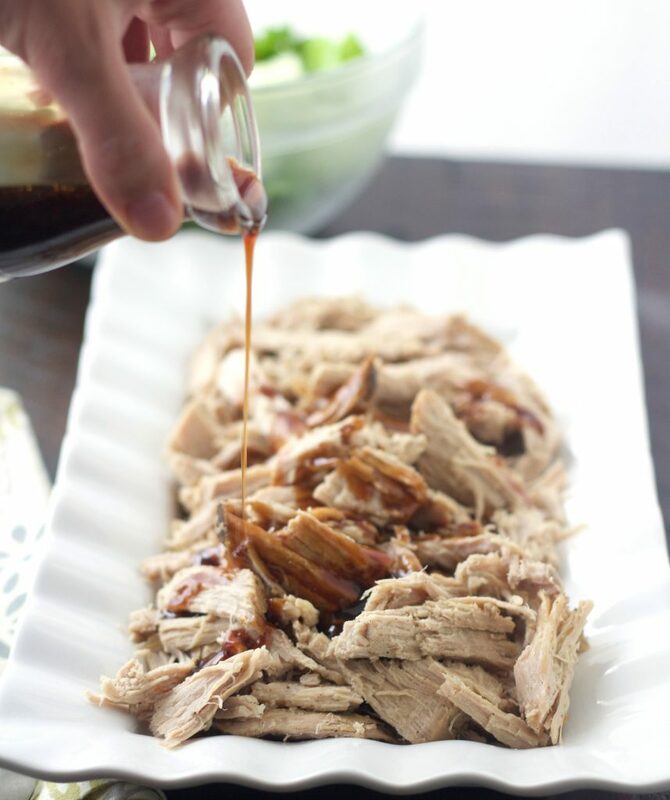 The pork itself is tender, juicy and yummy, but when you pour the balsamic glaze over it . . . .WaTcH OuT!! The glaze takes this pork to a whole other level (most of us pretty much have our pork swimming in the stuff). I usually just drizzle some of the glaze over the platter and then we add more to our plates after we’ve dished up. Not only is this pork delicious, it couldn’t be easier to make. I think this just may be one of my favorite pork recipes. It’s great served with our favorite yellow rice. This is one of my go-to recipes for Sunday dinners because I can throw it in my slow cooker first thing int he morning and when we come home from church, that’s one less thing I have to worry about for dinner. In a small bowl, combine the sage, salt, pepper and garlic. Rub the spice mixture all over the roast. Place the pork roast in the slow cooker and pour in the 1/2 cup water. Near the end of the cooking time for the roast, combine the ingredients for the glaze in a small saucepan and bring the mixture to a boil, then reduce and let the mixture simmer, stirring occasionally, until it thickens. Remove the pork from the slow cooker, shred and place on a platter or plate. Drizzle the glaze over the pork and serve. I usually one and a half or double the glaze recipe because we love the stuff and like our pork to be drenched in it, plus the sauce is also delicious drizzled over our family favorite rice. Absolutely loved this pork!! Delicious! Thanks Tiff! This is one of our favorites! My boys loved, loved this, I made it a couple of weeks ago for Sunday dinner, served it with hot yummy homemade rolls & a green salad.